In late 2013, veteran Bungie composer Marty O’Donnell finished Music of the Spheres, an eight-part musical work designed to be released alongside Destiny. It never came out. But today, thanks to an anonymous leaker, the elusive work is finally on the internet—at least until the copyright strikes hit. 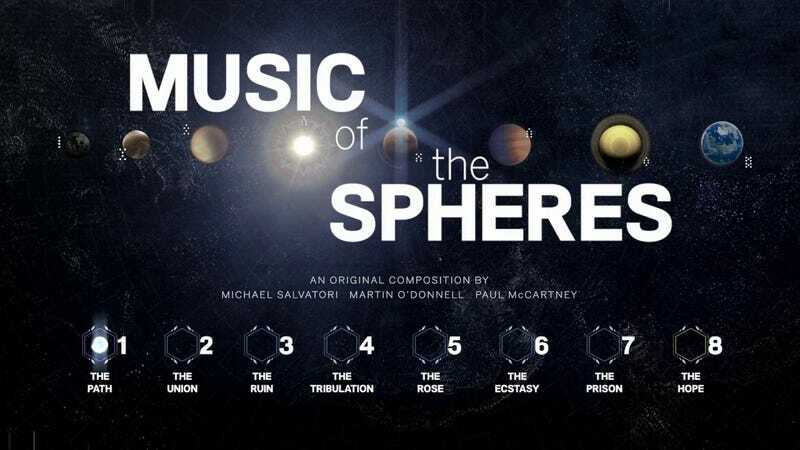 Composed by O’Donnell, his partner Michael Salvatori, and former Beatle Paul McCartney, Music of the Spheres was envisioned as a musical companion to Bungie’s ambitious Destiny. But Bungie and O’Donnell spent nearly a year battling over, among other things, publisher Activision’s failure to use O’Donnell’s music in a trailer at E3 2013. In April 2014, Bungie fired O’Donnell, and despite O’Donnell’s hopes, the company indefinitely shelved Music of the Spheres. He has made several public comments on the work since, and last month, he implicitly encouraged people to share it. In late 2016, teenager Owen Spence started his own independent project to recreate Music of the Spheres (as well-documented in this Eurogamer piece) using publicly available material. Spence has been in touch with me since then, and yesterday he told me via Twitter DM that he and a friend, Tlohtzin Espinosa, were contacted by someone with a copy of Music of the Spheres who wanted it to be public. So they put it on Soundcloud, where you can now listen to it all (until Activision takes it down). O’Donnell has not yet publicly commented on the leak—I’ve reached out for his thoughts—but it’s clear that he’s wanted this to happen for years now. Must be one hell of a Christmas gift. I’m quite relieved and happy. This was the way it was supposed to have been heard 5 years ago. My wife and I spent the afternoon with my now 93 year old father and we showed him that people were finally able to hear this work. It made our Christmas even better. My mother, his wife of over 60 years died a couple years ago and although she loved listening and shared it with some of her friends (she was a musician) she never understood why it wasn’t released. I don’t know who actually did it but they have my blessing. I honestly don’t know how anyone could begrudge this any longer.